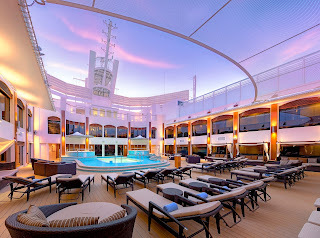 Now let me say that I have been aware of Norwegian CruiseLine’s Haven since its inception. 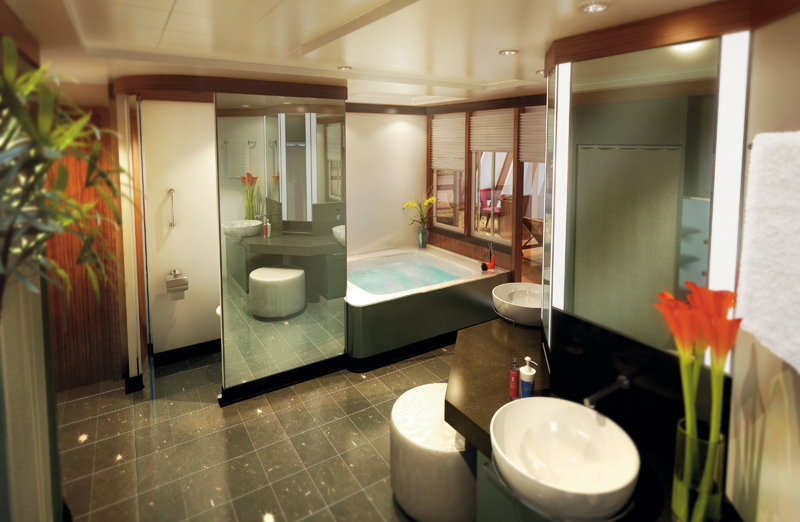 I have toured the suites on ship inspections and have written about the perks on earlier blogs. But it wasn’t until I had experienced the Haven for myself that I came to the realization that there was so much more to the Haven than a large, luxurious cabin. When you stay in the Haven you truly get that luxury small ship feel accompanied by unparalleled personal service, all while enjoying everything a mega ship has to offer! Embarkation day is always a bit chaotic. In our case we had flown from NY City to Barcelona the day before, dropped off our bags at the hotel by 7 AM and hit the ground running, trying to make the most out of our limited time in the city. The next morning we woke up bright and early and headed to the port. We were exhausted! I can’t tell you how satisfying it was to get on the shortest line in the cruise terminal and once issued a keycard to be personally escorted up to the Haven Lounge to relax with a mimosa while the steward put finishing touches on our suite! The suite itself was magnificent and so spacious! Room to spread out, room to work (if you must), room to hang out with new friends. The bathroom was more luxe than the master bath we recently renovated at home; great lighting (a constant complaint of mine when it comes to hotel rooms and ship cabins), plenty of storage, double vanities, jetted tub and a large shower that overlooks the sea! Before leaving home we received an email from the concierge asking our coffee preference (there’s an in-suite espresso/cappuccino machine), as well as beverage (liquor & soft drinks) and pillow choices! Its the personal touches like a foam pillow for my husband and a down pillow for me, as well as a fridge stocked with ginger ale for him and white wine for me that set the tone for the entire week! Our butler also noticed that we demolished the grapes and bananas from the fruit bowl daily but we left the apples and oranges. After the first day we always had bunches of grapes to snack on! As much as I love European cruising, it’s a fact that they are exhausting due to shore excursions leaving so very early. Can I tell you how absolutely divine it was to be able to enjoy white tablecloth in-suite breakfast every morning at 6:30 AM sharp (donning the bathrobe and slippers that were hanging in the closet)? And then to have priority tender boarding for going ashore! Who wouldn’t appreciate these niceties? Returning to our sanctuary every afternoon we were always greeted by name and there was always a little snack waiting on our dining table…chocolate covered strawberries, small sandwiches or freshly baked cookies to name a few. While the fun and excitement going on at the main pool area was of course available to us, I enjoyed the quietness of the Haven pool. Loungers were plentiful and a pool steward was always on hand to take drink orders. It was such a relaxing way to spend an afternoon! The Norwegian Epic is a very big ship with wonderful restaurants, bars and entertainment (I must say that the shows onboard were exceptionally good) so we didn’t spend all our time hidden away on deck 16! Still, it was nice to know that we were always an elevator ride away from the privacy and luxury of our suite. 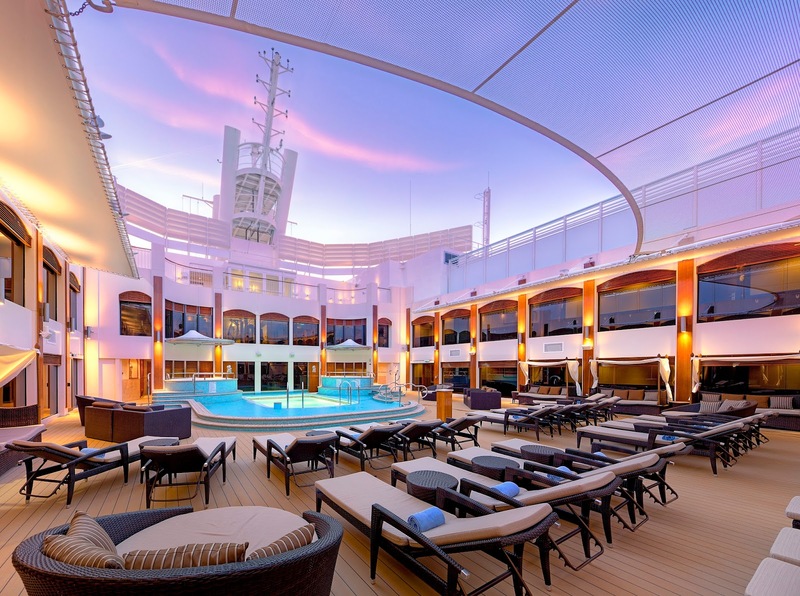 The Haven by Norwegian is indeed like having the best of two cruise ships rolled into one vacation…that very special luxury ship tucked within all a mega ship has to offer.